Ouch: Tom Cruise’s Ankle Has been Broken for 11 Months! 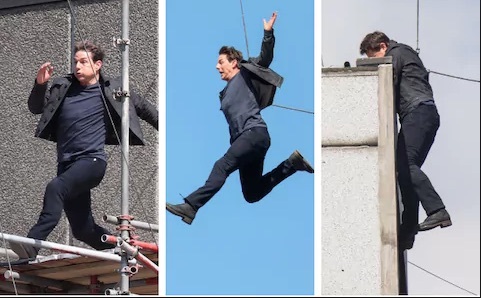 Back when Tom Cruise was in the midst of filming Mission: Impossible – Fallout, he broke his ankle while performing a scary rooftop stunt—and film of the incident went viral. While production on the film was temporarily halted, Tom went through 10-12 hours of daily rehab and returned to filming after just 7 weeks, all healed…or so we thought. While the star seems pretty nonchalant about the ways in which he compromised his recovery, the effect of his actions is fairly telling: Tom admits that his ankle is still broken today! In no world is it normal to have a broken ankle for almost a year! Sure, returning to work kept Tom’s movie on schedule, but what will he do when filming future movies? How will an improperly healed ankle fracture impact his career and his health down the road? Not too well, I’m guessing. Rushing recovery from a broken ankle is never a good idea, regardless of how great the incentive to do so may be. I can help you determine safe levels of activity during your recovery and rehab period, but you need to make sure any thing you decide to do while recovering from a broken bone is given the go-ahead by myself or another trained physician.